This pair of doors is suitable for internal or external use. 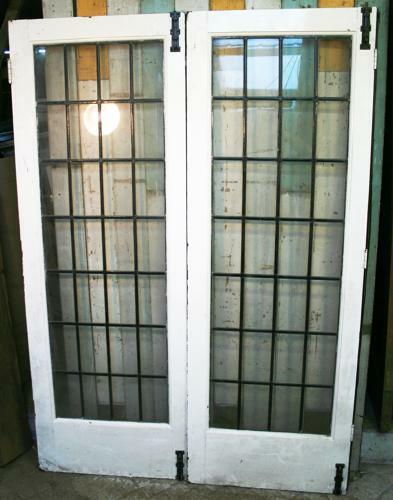 Made from solid pine and fully morticed and tenoned the doors have original leaded glass panels in good condition. We would advocate the addition of strengthening bars so the glass will pass modern safety regulations. One of the doors has hinges on both edges suggesting that there were originally 3 doors hinged together creating a concertina fold. The remaining 2 doors need minor conversions to be used as a pair. Please call us to discuss modification options and costs.